Robyn Vilate: Valentine's Day WIshlist! Valentine's Day is coming up fast and is one of the few holidays I can justify spending a little money on to 'babe it up' for my date night out! I have been loving the blush tones and think it's a perfect way to dress a little more "Valentines-y" by adding some pink, but still be able to incorporate it into my every day wardrobe! You can also never go wrong with a red hot dress or some gorgeous heels, and last but definitely not least- make it fun with a bright lipstick! 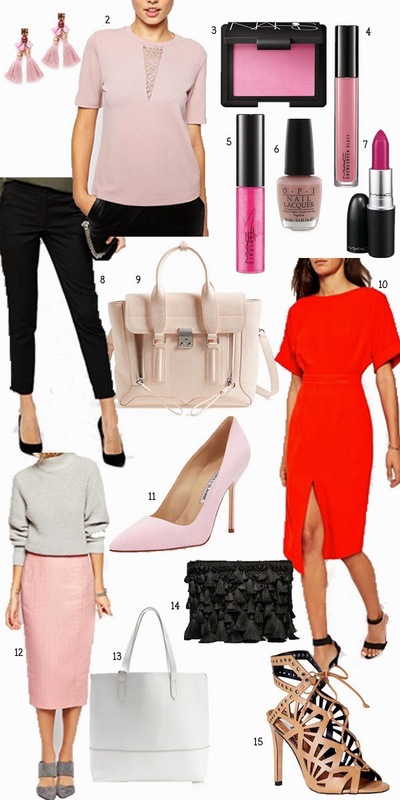 Especially if you're not going all out on the dress or outfit, you can always rock a bright pink or red hot lipstick! I am in love with that bag!